The seventh stroke of midnight is still echoing when the door creaks open. On the one side lies the library Elementary College, the worlds’ biggest collection of magical books. On the other side a group of bored students. It is said the library houses a copy of every magical book ever written, plus one book that is unique and can be found only here: The Big Book of Madness. It is a very dangerous book indeed, for it is not the words of ancient wizards trapped between its pages, although those would be dangerous enough, but a collection of hideous monsters. The book is really a prison. And a school was totally the best place to keep it safe. Seriously. Trust us. We’re wizards. Why is it that magical schools always have horrible security? Just pick up any book set in one, especially that really famous series, and see if the students don’t get into life-threatening trouble before the 50% mark. I’d sooner send my kids to Pogo-Sticks In A Minefield Elementary for safety reasons. 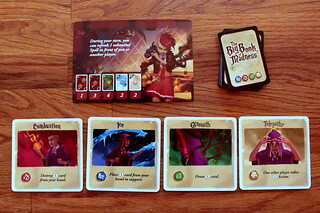 But the kids in Maxime Rambourg’s cooperative game The Big Book of Madness are at such a school, they are entering the library and they are opening the book that, unbeknownst to them, is a prison for monsters. And not a teacher in sight, of course. Probably polishing their wands. So the kids have to deal with this themselves. One by one, six monsters escape from the book. If the kids can defeat the last of them, they can sneak back to bed with some minor injuries and a better understanding what the words Do Not Touch mean. If they can’t – well, the book isn’t called “of Madness” for nothing. For each monster that escapes, the kids have five turns to deal with it. That’s in total, not each, so in a game with five players each player only has one turn per monster. When a monster escapes, it prepares three curses, plus zero to two more depending on the round and level of difficulty. If the players can counter all of them before their five turns are over, they defeat that monster and earn some small reward. If they can’t then there’s a punishment waiting for them. On the last monster that’s losing the game, the other monsters are less final. Each curse is triggered at the start of one of the five turns. If it’s not countered before that turn starts, it goes off and, being a curse, does something nasty to the players. Most of them add Madness cards to players’ decks, cards that do nothing but clog your hand and make you lose the game when the supply runs out. But even when a curse is triggered, you still have to counter it to win the round, it doesn’t disappear just because it hurt you. The first turn never has a curse, because that would be unfair, you have no way to counter it before it’s triggered. To make up for that, turn three has two curses that you should take care of before you get there. To counter the curses you use the Element cards from your hand – and for almost everything else, too. 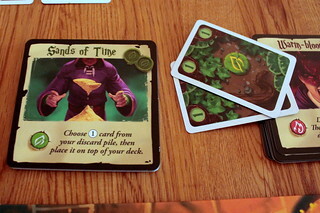 Players start with a mixed deck of those cards and a hand of six. On their turn, they can take as many actions as they can pay for with the cards, and countering a curse is one of those. To get rid of a curse, you discard Element cards. Depending on the curse you either need four of one Element or one of each. Discard them, remove the curse and add a new Element card to your discard pile, too. There is a strong deck-building element to The Big Book of Madness, and taking new cards as a reward for countering curses is the main way you add cards to your deck. Alternatively, you can also spend Element cards from your hand to add a new one to the discard pile. Getting cards into your deck is important, not because a bigger deck is that much better but because the cards you buy count as two or even three of one element while most of your starting cards only count as one. With the better cards, your hand of six just packs more oomph. So far, that’s all very mechanical: use cards to get rid of curses, get more cards, repeat. Where’s the magic? Well, as first year students the players don’t have that much magic to throw around, but they all know four handy staple spells, one for each element. The Earth spell, Growth, is simple. Discard one Earth, draw one card. You can overpay all spells with up to three times their price and multiply their effect, so you might draw three cards. When you don’t quite have what you need, but you know it’s in your deck, that’s perfect. With Fire you activate Combustion and destroy cards from your hands. Quite useful to manage your deck, but the other two spells are what really helps win the game. Ice, the Water spell, lets you put cards from your hand into the Support Pool. Each player can have three cards there, and they are available to all players to pay for their actions. With Telepathy, the Air spell, you allow another player to take one or more actions on your turn. Those two spells allow powerful combinations, for example you can put one card into your support pool with Ice, then cast Telepathy on another player to let him use that card together with his own hand cards to counter a curse, and all that before your turn is over, meaning before another curse is triggered. Especially in games with four or five players, you will use those two spells a lot. All players start with those four spells, but they are in the worlds’ biggest magical library. They can learn new and powerful spells, too. For each of the four elements, there are three spells of different levels in a game. There is more than one option for each element/level combination, so you’ll have different spells every time you play. They all continue the theme started with the basic spells, so Earth spells generally let you draw cards or add higher value Element cards to your deck, Water spells let you manipulate the Support Pool and Air spells let you give actions to other players. Many of these spells work on other players as well, some only work on other players, so whatever you do you interact a lot. Fire spells are special because some of them have a very important effect beyond destroying cards: they can heal Madness cards. Healing is different from destroying them in that healing returns them to the Madness Pile while destroying removes them from the game. Since one of the ways to lose the game is exhausting the Madness Pile, healing is a much better solution. That’s why, as a final way to use your Element cards, you can discard two of the same element to heal one madness card. 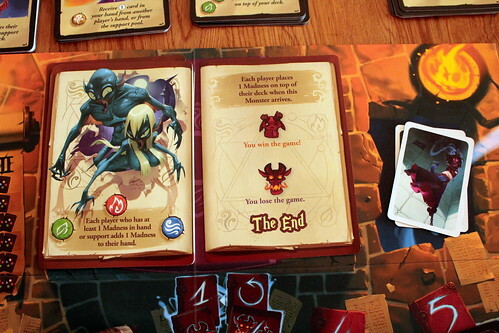 The game ends, one way or the other, after the sixth monster. But you can lose the game early if you run out of Madness cards or if all players are eliminated from the game, something that only happens when they have the hand full of Madness cards. That never happened in any of our test games, but it seems theoretically possible. That’s how the game is played, but is it fun? Lets talk about what may be a downside for some people first. Despite the beautiful art by Naïade, The Big Book of Madness may not feel as immersive to some players as other games. You don’t have any pawns to move around the board, all you do is play cards, so everything feels a bit abstract, you need more imagination to really see the action. But then, I presume most boardgamers to have better than average imagination anyway, so that won’t be a problem. And what you get in return is so worth it. Even for a cooperative game, The Big Book of Madness is very interactive. To put the monsters back in the book, you have to communicate a lot, and I mean a lot, so you can put the right cards into your support at the right time, receive Telepathy when you can do something useful and buy those spells and Elements when you can spare the resources. There’s no way to do that unless everyone knows what everyone else can do at all times. Even when it won’t be your turn for a while yet, keep communicating so the others know what you’ll be able to do. How exactly you put the monsters back in the book changes depending on your number of players. When playing in four or five people, you will spend a lot of time using Ice and Telepathy. Get those elements in the support pool, then let someone work with them that has the matching cards to counter the next curse.It’s a lot of fun because of how interactive it is, but you rarely get to use those big, fancy spells you bought. Playing in two or three players, things are completely different. You can’t expect someone to have the right cards when they are needed, so you everything at your disposal to defeat those monsters. You still interact plenty and you have to be more creative with your solutions. The game is a lot of fun with any number of players, and wonderfully interactive, but given a choice I prefer it in a smaller group. But no matter how many of you there are: if your Hogwarts letter still hasn’t arrived, then The Big Book of Madness is your chance to still lose life and limb in avoidable magical accidents, and have fun doing so. “Do you think anyone will know what happened here?” Draco asks, tossing white blond hair from his forehead. They look around the library. The floor is covered in shredded pages. All the shelves on the east side of the room have tipped over like a line of dominoes. There is, for reasons that would be tedious to explain, a lake of melted blueberry ice cream behind the librarian’s desk. A small banana tree grows besides it. Harriette shoos away the platypus sniffing her pockets for treats. “Nah, business as usual,” she shrugs and leaves the room.